Ever notice that most of the time in our beauty products there is a presence of vitamin E? Vitamin E is a multitasker for our health, hair and skin. It’s not just beneficial to only hair, health and skin but also for our heart, blood pressure, eyes, diabetes, etc. Here some of the Vitamin E benefits are shown related to your skin, hair and health. Vitamin E helps to restore the moisture of dehydrated skin. It works best for dry and damaged skin. You just have to do is mix a few drops of vitamin E oil in your favourite moisturizer and apply it on your body at night. Dark spots can be appear from variety of factors such as aging, liver problems, free radical damage, etc. Poke a capsule and mix it in any moisturizer or oil and apply on dark spots. Do this until you see the desire results. Vitamin E oil is beneficial for the new mommies as it helps to fade stretch marks. Stretch marks appear because skin loose it’s elasticity. Regular use of vitamin E oil will reduce the stretch marks. Just rub some of it on marks and sleep. Vitamin E oil will reduce all the chances of your skin becoming dull, wrinkled and dark. It will boost the production of collagen and maintain the elasticity. Use a few drops of vitamin E oil and apply on your sensitive area like around the eyes, forehead and cheeks etc. Vitamin E oil is also known for quick recovery from sunburns. Vitamin E contains antioxidants which will soothes the sunburn. Take few drops of vitamin E oil and gently rub it on the burnt area. Vitamin E oil is a perfect ingredient which your nails and cuticles need. As it is a great moisturizer it helps to treat dry cuticles and is a best substitute for cuticle oil. Apply few drops of this oil on cuticles at night and sleep. Like Onion juice Vitamin E oil repairs the damaged hair and promote hair growth. It improves the circulation of blood and make them strong too. Just mix one capsule of vitamin E oil with coconut oil it olive oil and massage your scalp. Vitamin E oil is very effective in slowing down the premature hair greying process. The presence of antioxidants reduce the probability of premature greying. Mix this oil in any oil of your choice and massage it on your scalp. From constant blow drying, curling, coloring there is always one problem arises and that is split ends. Split ends can be treated at home with the help of vitamin E. Take any hair oil of your choice and mix vitamin E oil with it and apply on split ends and tip of your hair as a serum. As to have Healthy hairs Healthy food is a key point but regular use of vitamin E oil make your hair healthier, stronger and shinier than before. It will condition your scalp and make hair smoother and softer. Vitamin E oil is also known to prevent skin cancer. Add 4-5 drops of vitamin E oil into your sunscreen and apply on your body before going out. Vitamin E oil used to treat minor injuries and burns. Take few drops of vitamin E oil on a cotton ball and gently apply on burns. Make sure the burns has cooled down. Vitamin E has the ability to heal wounds. Vitamin E is an effective treatment for skin problems like eczema and psoriasis. Apply the oil on affected area on regular basis for quick recovery. It moisturize the dry area which is the main reason for eczema and psoriasis. Damage of skin due to dryness can be easily treated with the help of vitamin E oil. Regular application can heal the cold sores. You can also apply it on your lips for treating lip sores. Vitamin E oil is enriched with antioxidant properties which will remove any free radicals from your body. It will improves the immune system and as a result of this you will fall sick lesser. The Vitamin E Benefits are really effective. You can do a small patch test before using it as to check whether you are allergic or not. If you love your skin and hair than add vitamin E oil in your regime. These benefits are really helpful. I didn’t knew many of these especially about the stretch marks. Vitamin E – The Beauty Elixir as I usually call it. This is a must addition in our daily dose of intake. Thank you for sharing many benefits of this. I use Vitamin E capsule for hair and skin. Indeed i agree with the points in your post Vitamin E has some amazing benefits. Vitamin E is crucial. We must incorporate it in our daily use in any form. I totally agree with you Vitamin E is one of the magical solutions to hair and skin issues. I have been using Vitamin E capsules for a long time for my hair and can see a visible difference. Vitamin E, the magical ingredient of many beauty products that actually works like wonder. 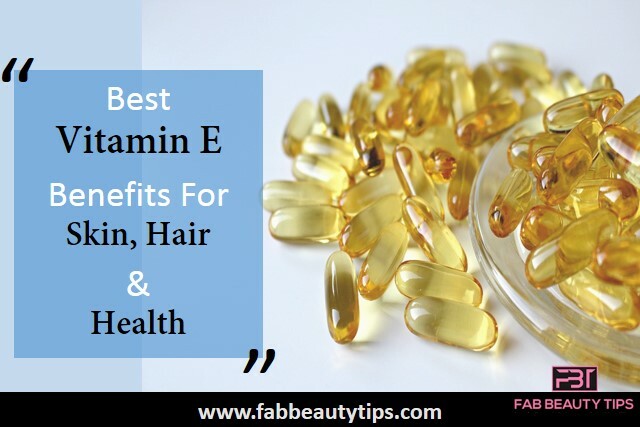 Vitamin E is really good for our skin and hair.. I love to take natural source of vitamin E.
Omg, was not aware that Vitamin – E has so many benefits, thanks for jotting them down! I really need vitamins for my my hair as i am having a hard time dealing with my bad hair days.